Picture dictionaries can't list the sheer number of words standard dictionaries of equivalent size can, but they have other virtues, and also they can still feature a vocabulary sufficient for basic use. 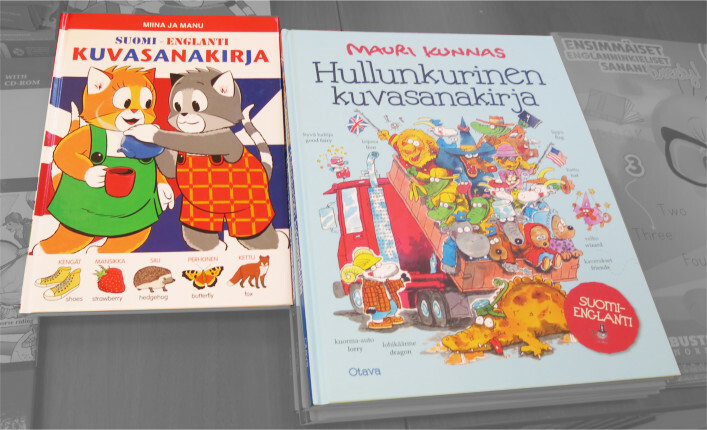 The main weakness as suggested above is that adapting foreign books means that much of what you would want to see in a book devoted to Finland is missing. Poro only makes it into the first book because there's a picture of one pulling Santa's sleigh. 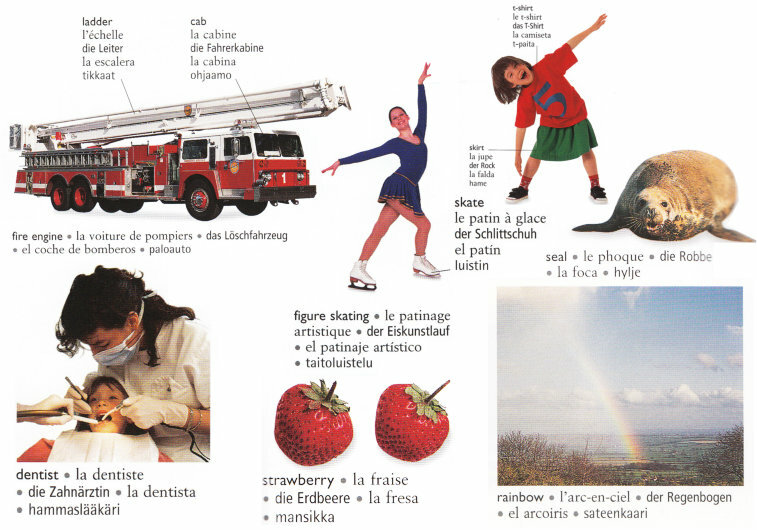 (Five Languages' Picture Dictionary) pub. Dorling Kindersley/Karisto Oy 2003. This is a pricey book, nearly 33 euroa when I bought it, and more when I last spotted it. However, it's lavishly produced, uses colour photography throughout, and claims to list 6,000 words. The other languages are English, French, German and Spanish; and Suomi has replaced Italian for this edition. As you can see, every entry is captioned in all five languages, which you sort of get used to, but it's not as clear as having one language. Apart from that, the book is attractive and invites exploration. It's oddly limited in certain areas, I thought, but you might not agree. It sometimes jars when eg. you get two whole pages devoted to baseball, without any reference to Finland's national sport pesäpallo. And I suspect a Finn would be unimpressed by the section devoted to weather. 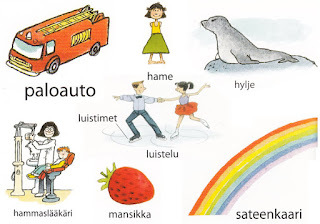 Learning vocabulary can be a slog in any language, and in Finnish it's harder than most. The only foothold you get early on consists of the borrowed words you detect, especially from English these days. Most people learn words through association, visual association in particular. So a good attractive picture dictionary is an ideal tool for learning, both in the early days of study, and later for revision of topics. All of these books are fun to browse, and I've picked up a few more words just by working on this post. 3. Suomi Englanti kuvasanakirja pub. Satukustannus/Brown Watson. I can't find a date for this one but it was still in the bookshops last time I checked. The content is somewhat dated - a translation is offered for 'video cassette'! The hardback book is in a smaller format, a little bigger than A5 and also has the virtue of being rather cheaper than the others. The artwork may not be as classy, but the range of vocabulary is very good, despite the fact that like the previous examples it's based on an English language publication. I tried to pick out a group of the same words from each book: it turned out to be harder to do than you'd think. There are simple differences, like one book listing 'mansikka' and another the plural 'mansikoita'. 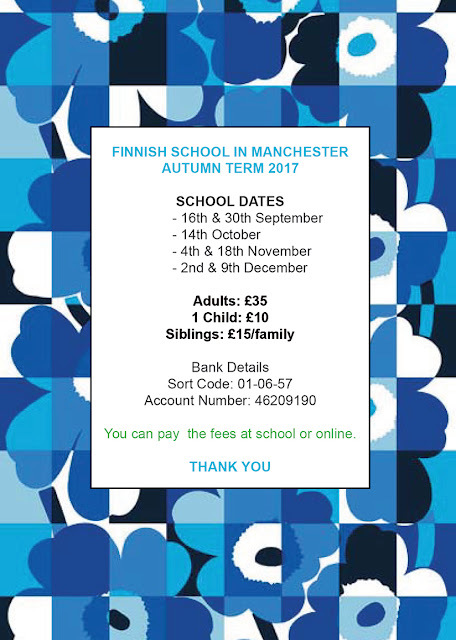 Not a problem, obviously, once you learn about Finnish plurals and the partitive. Then there's the varying difference of American influence reflected in each book. None of them consistently prefer either British or American terms. Anyway, the last book I'm looking at is different because it's actually Finnish. 4. Kuvasanakirja pub. Mermerus Ab Oy 1996. This one is my favourite, even though it's older and doesn't have the size of vocabulary of some of the others. I saw it not so long ago, so I hope it's still available. 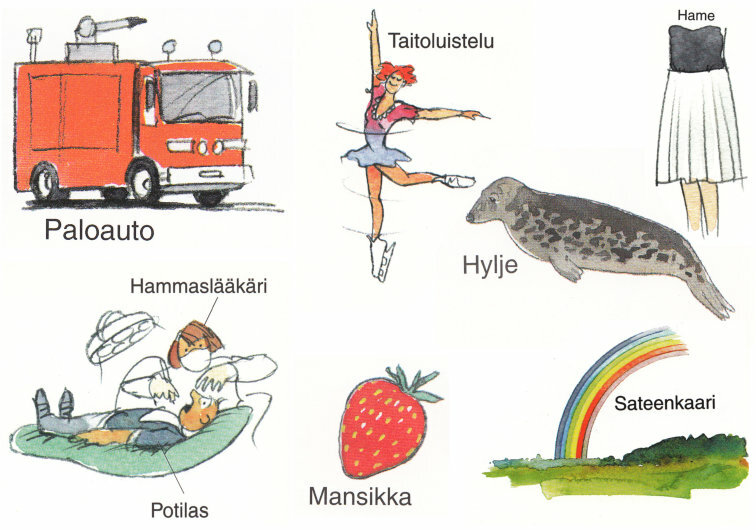 The artwork is very nice with a touch of humour, and its content does reflect Finland and Finnish people. At last we have a wildlife section featuring such as silakka, hirvi and supikoira, though I wish there were more - there's no ilves or liito-orava. All sorts of other things which make me think of Finland: pilkkikalastus, huurre, mökki and, yes, pesäpallo. 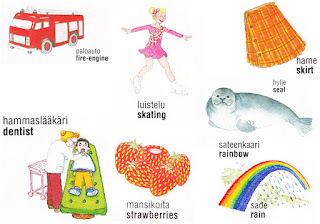 I believe I've seen a more recent Moomin-themed picture dictionary, and there must have been one or two others of Finnish origin. Most of them are generic and based on foreign publications, but even if that's all you find, I recommend picking one up, because their usefulness outweighs the oddities. Hopefully a publisher like WSOY will get round to putting out a new one soon, with proper Finnish content. Update! 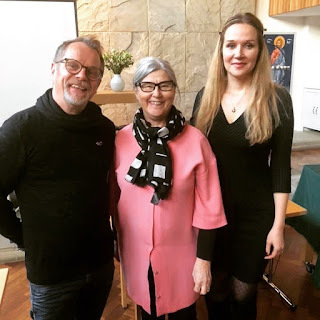 March 2017 - I've just returned from a trip to Finland, and naturally I browsed bookshops. I was looking for other books and things, but I did wonder what learning materials were available. Overall, the resources on offer seem to have stayed about the same. I'm afraid all are expensive and I don't think that's going to change. It might be an idea later to pick an 'essentials' list, ie. suggestions for the best options for a language learner to spend their money. As far as picture dictionaries are concerned, I only spotted 1. and 2. from the list above. 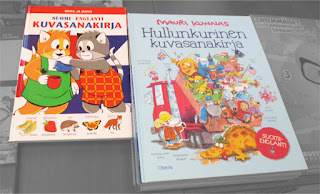 However, here are two others which are new to me, but I believe Päivi mentioned the Mauri Kunnas volume in her comment below. It looks pretty good, going by a quick flick through. The other book is cheaper but is more ordinary. The nice thing about both is that they are both Finnish originals ie. not translated from foreign publications. We have Hullunkurinen kuvasanakirja by Mauri Kunnas with useful words such as hyvä haltija, uninen matkustaja and menopelit, translated as "things that go vroom".